Here is a breakdown and a little more info on our personal Aquaponics system. It has currently been running for 2 yeas now with one cycle of Tilapia as our harvest fish. This chronicles our first year. Fish tote, grow bed #1, grow bed #2, biofilter, water pump, fish tank heater and 2 bell syphons. Our system is currently being run off a single 180 watt solar panel coupled with a 5000 watt inverter and 4 deep cycle rechargeable batteries. We obtained a tote to be used as our fish tank, cleaned it out exceptionally well and cut off the top 1/5 of the tote and flipped it upside-down to create the first grow-bed. Smaller Aquaponics systems can run with just this one grow-bed if desired. We also added our "starter fish" at this time. When you first start an aquaponic system you need to put in starter fish to get the nitrogen cycle going. These fish need to be some of the toughest fish in the neighborhood because they will have to put up with a whole variety of unpleasantness as the water settles into its natural cycle. Until the natural friendly bacteria starts up there will be peaks in both Ammonia and Nitrites and it is essential that the starter fish that you select are able to tolerate this. We selected large "feeder" goldfish from the pet store, as they grow quickly, don't require heat, are very hardy to water fluctuations, and lastly, are very inexpensive. These fish are doing a valuable job for you so make sure that you look after them while the tank is starting up; don't forget to feed them and don't let water conditions get too extreme. Keep an eye on the ammonia and nitrite levels and be prepared to do a partial water change whenever needed. We use a "Master Test Kit" (made for aquariums) to check the nitrates, nitrites, pH, and ammonia levels weekly. A pet store sales associate should be able to tell you how to use one to take readings. Our tank hold roughly 250 gallons and we started with only about 30 starter fish, so there weren't very many "swings" in the above mentioned nutrients during the cycling period. *NOTE: DO NOT add your "harvest/ stock fish" until the tank has been completely cycled. This should take about 1-2 months. The starter fish can either be removed, used as a food source for the new fish, or left in the fish tote to live along side your future harvest fish. 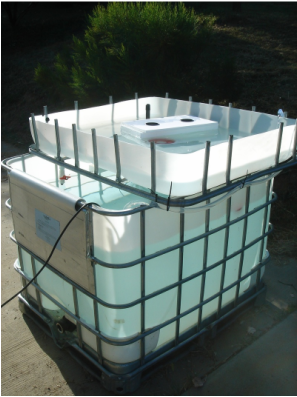 We first started our system with individual plugs grown right in water, (called deep water culture), planted in a hydroton medium, in net cups which are suspended in foam. In the beginning the water never drained completely empty, but rather, was at a constant flow, keeping the oxygen and nutrients available for the plants. We built second grow bed. Installed pump and all pipes, biofilter and bell syphons. We lined our second grow bed with thick 8 mil plastic lining. 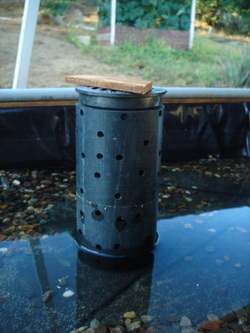 The Biofilter was created using a bucket, gravel, floss medium, and lava rock. The idea was to catch any large particles and serve as a biological "well", or home, for the good nitrifying bacteria. • As the water level rises in the grow-bed, water is forced through the teeth on the bottom of the bell and up between the walls of the standpipe and bell. (Standpipe, the second smaller PVC pipe shown). • As the water level exceeds the height of the standpipe and the drain begins to fill, a siphon is created. 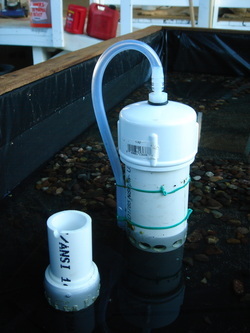 • Most of the water in the grow-bed is then drained by the siphon until the water level reaches the height of the teeth and tip of the snorkel. • Air is then forced through the snorkel, and as a result the siphon is broken, resulting in the grow-bed beginning to fill again; then the cycle then repeats itself. In addition to these we also have an emergency overflow pipe. This acts as an emergency drain so if your bell syphon fails the growbed cannot completely overflow. The E-drain will overflow the water back into the fish tote instead of all over the ground. It took us a couple months of trial and error, but we finally got our custom bell siphons to work perfectly. As of today it has been operating for over two years without a single fail. Cover for a Bell Syphon, this helps keep out debris, rocks, and roots. After trying the deep water culture for a couple months while the system was cycling, we decided we wanted to switch the system to an "Ebb and Flow" system where the plants are put directly into a planting medium, and the water filled and drained (instead of consistent flowing). So we "filled in" the water basins with gravel. The system was easier to keep free of algae when designed like this. We also took our indoor started plants and got them ready to plant! Lastly, we added the bamboo skirt to create a storage area underneath. We planted all of our starter plants. Mostly lettuce and some spinach, but we also planted a couple varieties of basil, squash and tomatoes. We planted the plants first to make sure there was enough filtration for the upcoming harvest fish. But by the time the plants were big enough to have a higher nutrient requirement the fish were large enough to provide it! The exciting day we added our "Harvest Fish"! We chose tilapia as they are easy to care for and generally reach a harvestable size in about 9 months. In this picture they are approx 6 months old. We bought them as tiny fingerlings and kept them inside in an aquarium for about two months until the aquaponics tote was ready for them. Unfortunately we had heavy losses in the first year experimenting with Tilapia. We started with 75 fingerlings, but lost more than half to an aquarium disease unknowingly brought home from a pet store. We ended up adding about 35 to the tote. We planned it out so that the fish were put into the system in early spring, so they had more opportunity to grow, better weather (warmth), and also to fertilize the tote for our upcoming spring plants. Watch your plants grow and harvest as needed! Lettuce grows really fast! We harvest by snipping off the outside leaves as needed. There is nothing better than fresh home-grown butter and flame lettuces! Large plants! They grow VERY quickly in an aquaponics system. We had more than enough lettuce for eating, more than enough basil for pesto and plenty of tomatoes for salsa! By summer the lettuce was ready to be harvested and cut down. We did let some bolt so we could collect seeds. We always buy heirloom plants and save seeds. At this time the basil and tomatoes are still going strong. We got a ton of tomatoes from three tomato plants. We chose a smaller variety, yellow pear, and they did exceptionally well, but grew almost too big for the grow bed! * Tomatoes are generally not recommended for aquaponics systems unless it is well established and nutrient heavy (lots of fish). By the end of summer everything had bolted. We collected seeds, had one final harvest and then tore the plants out, cleaned it up and got it ready for next spring! Since it was our first year and we were still experimenting and learning, we unfortunately had a loss with our fish as we let them live into winter and lost them due to the cold. Tilapia need water over 55*F to survive. Right about 55* degrees ours got very lethargic and the next cold night they died. We did utilize an aquarium heater, but it was not strong enough to heat the large tote, and a larger wattage heater would drain the solar system before the nights end. We are now working on building a hoop house (mini-greenhouse) so we can grow plants and fish year round! We are excited for 2014 and the new growing season!